Wouldn't it be nice if you could have a little kick of flavours in your gameplay? Well, if you've been sharing this view, your call has been answered! 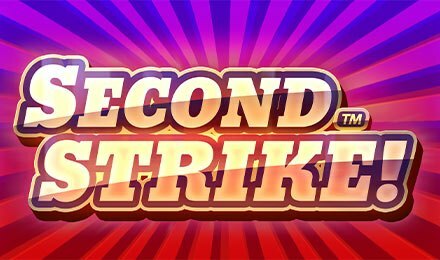 Wicked Jackpot is proud to present Second Strike Slot, a fabulous and delicious five reel slot game by Quick Spin. Watch out for the overdose of thrill infused in this one! You might end up craving for more! A colourful online slot machine awaits you on Wicked Jackpots, packed with some fruity symbols like cherries, plums, melons and grapes. If you thought that was it, well as you spin Second Strike Slot, you will find other well-designed symbols such as bells, lucky 7s, stars and diamonds. Now, in the event you land 5 diamond symbols on a payline, you can enjoy 1,000-coin payout. There’s no scatters. Bet Levels: You will find no Bet Levels on Second Strike Slot. Amount of Paylines Selection: When it comes to the amount of lines selection, you will find 10 paylines. Coin Values: No Coin Values available here! The Total bet ranges from 0.10 to 100.00. Are you looking for the wild symbol? It is the golden square with the word WILD labelled at the centre. All the wild symbols and the other symbols that take part in the Second Strike win, will not be replaced by the extra symbols. On the reels of Second Strike Slot, all the wild symbols can take place of all the symbols on the reels. This feature is activated on any symbol line win. When the feature is triggered, it can add symbols to the reels in the event the outer wheel marker comes to an end on the symbol from any of the initiating win line. During the Second Strike Feature, you will find that 6 to 10 extra symbols will be added to the game for some extra wins. If you get 3, 4 or 5 of a kind, you will be rewarded with the following extra symbols respectively: 6, 8 and 10. The AutoPlay Feature is available on Second Strike Slot and as you hit the button which is normally found on the right-hand side of your main screen, the reels will spin automatically. You can choose from several plays: 10, 25, 50, 75, 100, 500 and 1000.